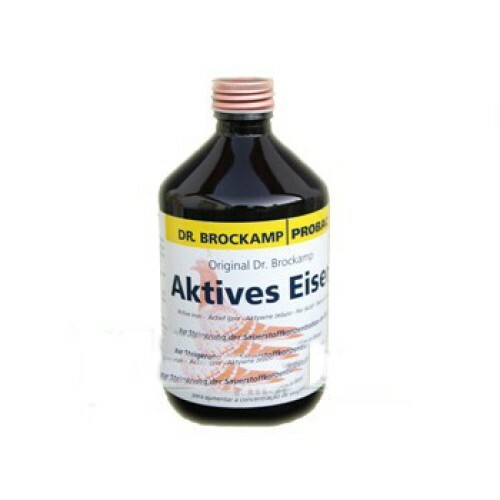 Aktives Eisen by Dr. Brockamp to raise the oxygen concentration in blood in racing pigeons. This type of specific organically bonded iron is, in contrast to other iron preparations, optimally absorbed and utilized by the pigeon’s system. Iron, as an important component of haemoglobin, enables the red blood cells to transport oxygen. Haemoglobin binds inhaled oxygen and transports it to the cells of the body. Especially in periods of high physical strain such as travel, breeding and moult, the amount of iron required rises. Iron deficiency is thus one of the most common deficiencies of our racing pigeons. The direct result is a deficiency in Haemoglobin which leads to an insufficient supply of oxygen for the entire organism. In addition to this other metabolic processes are inhibited. The racing pigeon gets its energy for flight primarily from lipometabolism. The allocation of the energy released by this requires much more oxygen than, for example, that required by the carbohydrate metabolism of humans. This points at the importance of an adequately high concentration of haemoglobin in the blood of the pigeon. Energy in the form of fat, carbohydrates and protein, as well as vitamins, minerals and trace elements are at the pigeon’s disposal through a balanced diet. The presence of a sufficiently high concentration of oxygen in the blood during competitive flight thus becomes the decisive factor, especially in endurance performance. Active Iron boosts blood production, especially raises the red blood cell count and increases the concentration of haemoglobin. Thus the concentration of oxygen in the blood is increased and its transported to the body cells faster. This leads initially to an improvement in physical condition and therefore to better training results, and finally to a natural performance improvement in competitions. Illnesses of the digestive system hamper the absorption of iron. Insufficient acidity of gastric juice, for example, or changes in the mucous membrane of the upper small intestine as well as its affection through harmful bacteria can all be causes for this. Therefore special attention should be paid to the maintenance of the natural intestinal flora of the pigeon. Active Iron should always be administered when extreme physical demands are made on the pigeon. Especially during the competitive season drinking water should be supplemented at least twice weekly with Active Iron. Ideally Active Iron should be administered 2 to 3 times weekly as early as 3 to 4 weeks prior to flight season in order to optimally compliment the pigeon’s iron reserves. Depending on the physical stress demanded of the bird, a dosage of 5 ml of Active Iron in 1 to 2 litres of water or feed per day for 25 pigeons is recommended.